This is a great and hardy cross of two popular outdoor strains. Erdpurt flowers a little later than Pibeurt, but is super hardy. 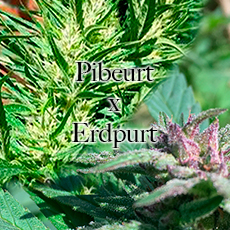 Erdpurt is colorful and has a berry flavour that also expresses in phenotypes in this cross. There is some variation in the phenotypes - some flower super early - others a little later. But all are super hardy and well fitted for growing outdoors in cold climates.